I’ve enjoyed film for pretty much all my life, but I didn’t truly come to appreciate and love it as an art form – as something more than simply entertainment – until my first year of college (I know, how cliché). I didn’t just come to love watching film, but (as you can obviously see as I write this) I came to love reviewing and discussing the medium with others as well. The first critic who introduced me to film criticism was Roger Ebert. His reviews were the first to really click with me. It wasn’t because I always agreed with him (because I definitely didn’t); but it was because I truly, truly admired his love of film. It was a contagious sort of love, a passion I never knew could be had for motion pictures. Following his example I too began writing about films and discussing them on forums and blogs. These discussions opened up the door really, and I charged head first, exploring the medium more deeply than I ever imagined I could. It became a journey that I can honestly say made me the person I am today. Film was, and always will be, what I turn too when I am happy, bored and most importantly when I am sad. The best example I have of this was when my grandfather passed away years ago. It was a special sort of hurt, and no discussions with family or friends could do much to quell that pain. I remember sitting down the night it happened, alone in my dark room, and deciding to watch ‘Amelie’. It is a film I adored, one of the few films that truly moved me with every viewing. When it ended, as it had done many times before, I had a huge smile on my face. It did it again. Film did it again; it was once again one of the few things in my life that could heal, or overshadow, any hurt I happened to be feeling. I don’t think I would have known about or adored ‘Amelie’ if not for the journey my love for film had created – a love that wouldn’t have blossomed without the analysis and discussions I had about them – discussions I would never have started if I hadn’t read Roger’s reviews religiously and decided to start writing some myself. That is why I was deeply saddened when Roger Ebert passed away. He is one of those rare people for me who although I never actually met or spoke with him, he still managed to have a profound effect on my life. An effect that still moves me, as I learned today as I finally watched ‘Life Itself’. I shamefully had put it off for far too long, partly because I think I knew the sort of emotional response I would have towards it. But as the quote I began this posts says, film helps us “identify with the people who are sharing this journey with us”, and it was about time I took a look at the journey that was the life of Roger Ebert. And boy, was it rough. It did bring me to the verge of tears, as I expected, but I loved every minute of it. ‘Life Itself’ is an honest and in depth portrait of a man who wasn’t without his faults. But no matter what battles he encountered – either with alcohol, his colleagues, or cancer – he still faced everyday ready for what came next. He had a passion for life that was reflected in his passion for film – or maybe the other way around. This for me is what shined through the documentary, handled with such care and attention by Steve James. It is an affectionate tribute to a man who moved so many, generating the very same empathy that Ebert himself loved about film, and for that I think it deserves two big thumbs up. More of my nonsense on Twitter. 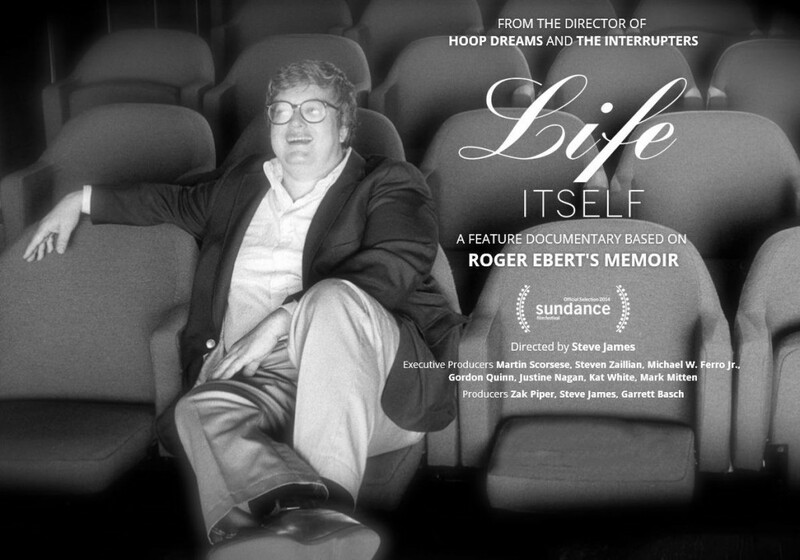 This entry was posted in Film, Film Review and tagged 2014, documentary, Film, Life Itself, review, Roger Ebert, Steve James. Bookmark the permalink. Great review. I haven’t seen this one yet but I’m about to post a guest feature on it this week – Keith from Audiences Everywhere discusses how Ebert influenced his appreciation of movies and explains his personal reaction to the film. You might like to check it out when it’s up this Friday as you share similar feelings.